It was an excellent idea because not only I got to visit a dear friend, Samuel, another friend, Andra, was able to come along for this trip. Not only that, without even planning anything, my visit was coincided with not one, but two different flower festivals. I am not a flower person. I get that flowers are pretty and all, but I never really wanted to grow flowers or be given flowers, ultimately, I never dreamt of going to a flower exposition, let alone two. Taiwan has successfully changed my attitude. I went to TWO flower festivals (this and this) and even declared calla lily as one of my favourite flowers! However, with good times always come some bad times. During my time in Taiwan, 2011 Japan tsunami happened. Taiwan, being so close to Japan, got quite an impact – the weather was horrible almost all the time. Proof? 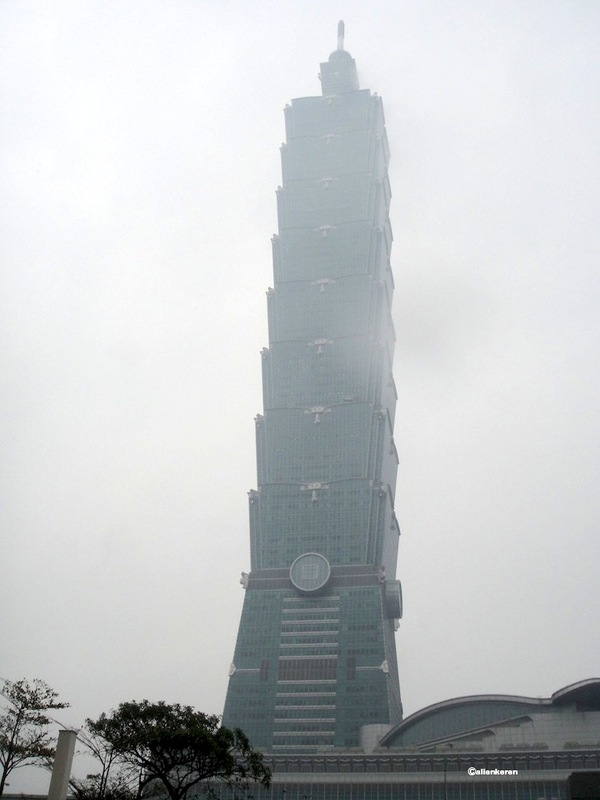 Take a look at a picture of Taipei 101 that I took a day before the tsunami below. 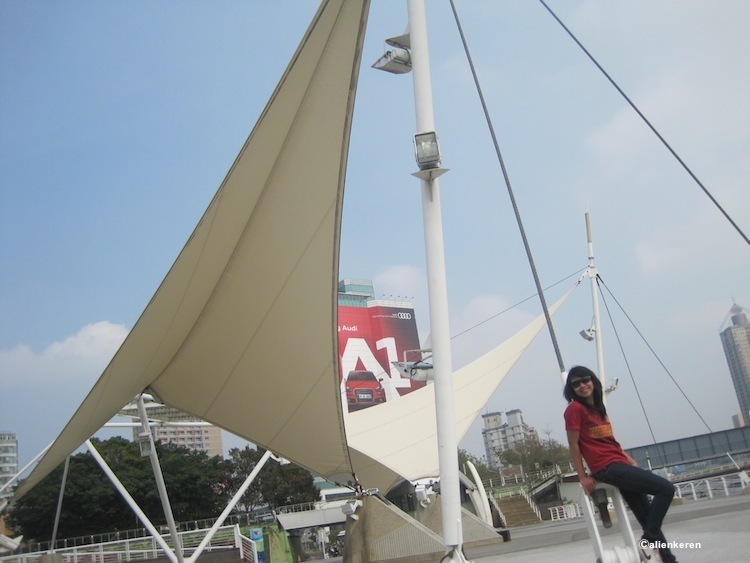 To get some sunshine, Andra and I went south to Kaohsiung. It is said to be one of Taiwan’s most popular tourist destinations, mostly because of the sunshine. One of its most popular destination is the Love Wharf (Fisherman’s Wharf by the Love River) – it is famous for being the most romantic place in Kaohsiung, if not Taiwan. Frankly, I did not get it, but it was probably because I am not a romantic. When one of Taiwan’s world’s famous romantic comedy series called Sweetheart was largely film in this location, who am I to say that it is not a romantic place? Taiwan, in my opinion, truly reflects what Asian countries embodied: constant innovation while keep respecting tradition. This is shown in the Taiwanese everyday lifestyle. For example: they treat Taipei’s Metro like a shrine while being reminded of the country’s founders everywhere they go. In the case of Taipei’s Metro, it is truly remarkable how absolutely no one eat or drink inside the station and the trains. I was in awe at how Taiwanese refuse to sit on the handicapped/pregnant/old people’s designated seats. It is also very touching how the Metro company is constantly reminding their passengers to get a grip – I like to think that the “get a grip” campaign extends to not only while riding the Metro, but also in life. In the case of the country’s founders, I genuinely admire how Taiwanese respect them. I mean, everywhere I went I constantly met gentle reminders of Chiang Kai-Shek and Sun Yat Sen. I think Indonesia should learn more about respecting our national heroes from Taiwan. Furthermore, Taiwanese’s lifestyle of keeping innovation and tradition hand-in-hand reflects on their food and entertainment. Below are photos food I encountered during a walk in Dansui Street Market. At one end I found a stall that sells traditional delicacies such as snails, while at the other hand I found a super modern Spongebob Squarepants cake. Another time, I found the extremely innovated 6D cinema – I was amazed by it but did not have a heart to spend tons of money for a movie. Turns out, a lot of Taiwanese, especially the old ones also opt for another type of entertainment, a free and more traditional one: Chinese chess. I had a great time in Taiwan: meeting friends, encountering new traditions, exploring recent inventions. However frustrating it is to walk alone in the streets of Taiwan, because it is really hard to find someone who speaks English and impossible to find food that are pork-free, I still want to go back. Hopefully, the next time I travel there, The Queen still stands tall in Yehliu and this little formosa island is not washed away by global weirding. March 31st is Samuel‘s birthday and with this post I would like to say happy birthday to one of my dearest friends in the whole wide world. Been about four years now, I hope Taiwan is treating him good and vice versa. I hope his life is always showered with happiness and I really do hope we get to see each other in the near future.